Just because I believe that science works, and that its methods are sound, doesn't mean that I have to like its conclusions. 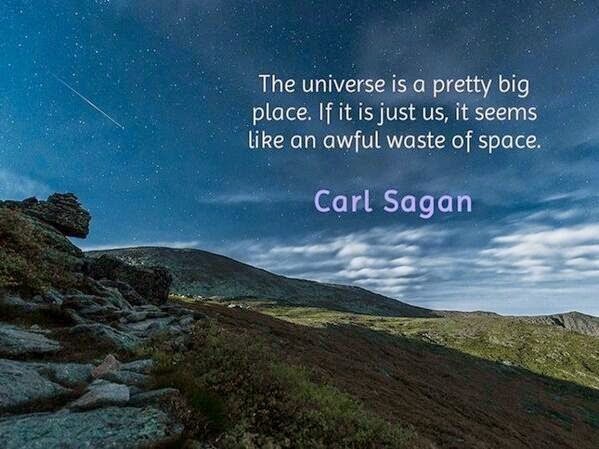 And one of my least favorite pieces of sound scientific reasoning is Fermi's Paradox. Named after the Nobel Prize-winning physicist Enrico Fermi, Fermi's Paradox originally took the form of a succinct response to all of the speculation about life in other star systems. According to everything we know about stellar evolution, planet formation, biochemistry, and evolutionary biology, life should be common out there. And just considering the fact that some star systems with planets are likely to be considerably older than ours, it also stands to reason that there should be civilizations out there considerably more advanced than ours. Being someone who would love nothing better than to witness the discovery of extraterrestrial intelligence, I find the Fermi Paradox a significant downer. I do have one possible answer that may still allow for a rich diversity of intelligent life in the galaxy, however; because we are looking for communication in the radio region of the spectrum (the fashion in which we as a species first learned to do long-distance transmission of information), it might be that such discernible, signal-producing modes of communication are quickly superseded by more sophisticated technologies that produce much less in the way of a footprint when observed from light years distant. In other words; societies might only be detectable during the first few decades of their technological existence, when they're communicating with each other by shouting from the rooftops. After they learn more efficient means of transmitting information, they seem to go silent. I hope. Because otherwise, it's mighty lonely here, you know? All of this comes up because of a paper published just last week by Michael Hippke, Wilfried Domainko, and John Learned called "Discrete Steps in Dispersion Measures of Fast Radio Bursts." In this interesting bit of research, an analysis was done of the dispersion measures of microseconds-long pulses in the radio region of the spectrum. The paper is quite technical -- even with a B.S. in physics, it was over my head -- but insofar as I understand it, the curious thing about the eleven radio pulses thus far detected is that their dispersion measures are all integer multiples of 187.5 parsec/cm3 -- something that admits of no particularly obvious natural explanation. (A)n extragalactic origin would seem unlikely, as high (random) DMs would be added by intergalactic dust. A more likely option could be a galactic source producing quantized chirped signals, but this seems most surprising. If both of these options could be excluded, only an artificial source (human or non-human) must be considered, particularly since most bursts have been observed in only one location (Parkes radio telescope)... In the end we only claim interesting features which further data will verify or refute. They also suggest that the FRBs might actually be perytons, signals that appear to originate from space when they actually are entirely terrestrial in origin -- i.e. human-generated signals that are being misinterpreted, or simple radio telescope glitches. Whatever the explanation is, the FRBs are an interesting phenomenon, and give me hope that there might be an eventual answer to Fermi's Paradox. I have to be careful about letting my desire for there to be intelligent life elsewhere in the universe get in the way of my objectivity in evaluating the evidence at hand; but even so, the strange mathematical pattern that Hippke et al. have discovered might be the best contender we currently have for an alien civilization saying, "Here we are!"